We packed up and said goodbye to our beautiful camp spot, it was an early start as unusually for us we had some big miles to cover to reach Bright and the “Adventure Travel Film Festival” by nightfall. It reminded us why we don’t travel like this very often, we spent the whole day seeing interesting looking places that we wanted to stop and look at but couldn’t or we wouldn’t make the distance in time. 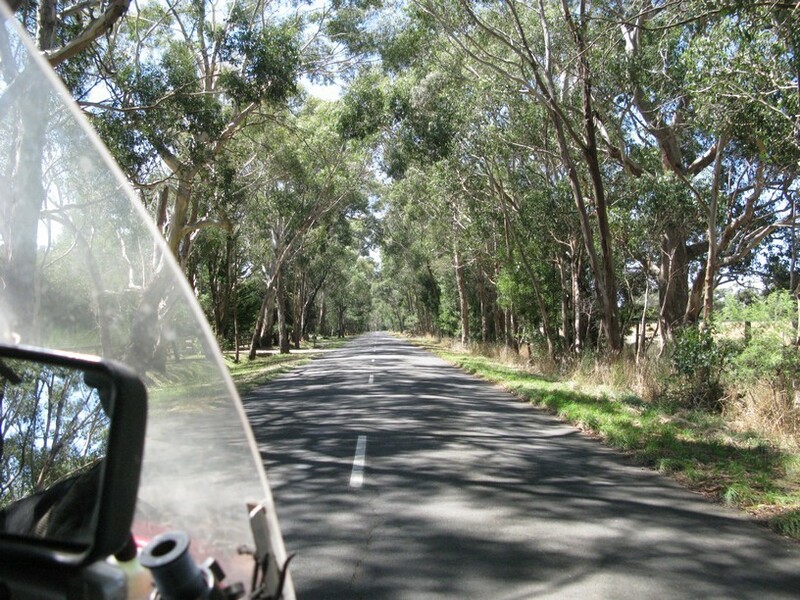 The countryside in Victoria is markedly different to South Australia and the further we rode across the greener it got. The trees were much more prolific and bigger too but there was a notable drop in temperature although it was still a beautiful day. We fuelled up at Myrtleford and as often happens got talking to quite a few people in the service station (or servo if you are Australian) We got a nice surprise when Karen walked in to pay, the attendant said “are you on the Guzzi that’s going around the world” yes she replied “it’s already paid for” he said. Some kind soul treated us to a tank of fuel and we never did find out who it was. Thank you if you are reading this, it made our day ! Our next stop was Bright itself, a very alpine looking town and a ski resort in winter. Spotting a supermarket we swung in to top up our supplies for the weekend. When we were packing it all away on the bike I suddenly realised our leather cowboy hats were not in their usual position in the cargo net on the front box. They have lived there all the way around Australia with no problem but someone had taken them whilst we have been in the shop. 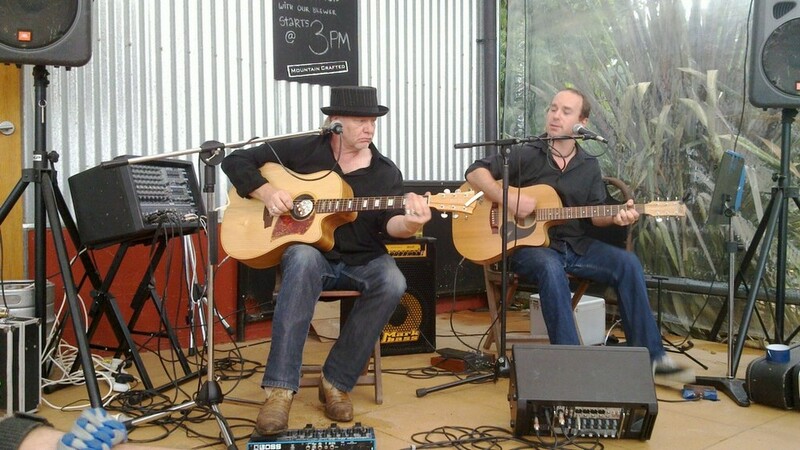 We were gutted, they have come halfway around the planet with us and are like old friends we mourned the loss. We rode to what we had been told is the cheapest camp site in town but at $36 a night it’s the most expensive camp site we have stayed in since Ayers rock. Bright is touristy and touristy inevitably means expensive. We cannot camp out of town as our bike is to be on display at the festival. The morning brings more annoying thievery, we put our perishable food in the fridge in the camp kitchen and it seem someone has been helping themselves to the contents during the night. We had treated ourselves to bacon and eggs for breakfast for the first time in months and that’s gone together with a brand new block of cheese and a loaf of bread. Someone else had a bottle of champagne stolen so it wasn’t just us. The next night other stuff goes missing and it seems the local kids think it’s alright to come into the camp ground and help themselves. It’s a shame because we have never had any problem with security or theft right around Australia and it really spoilt our impression of what otherwise would be a nice town. 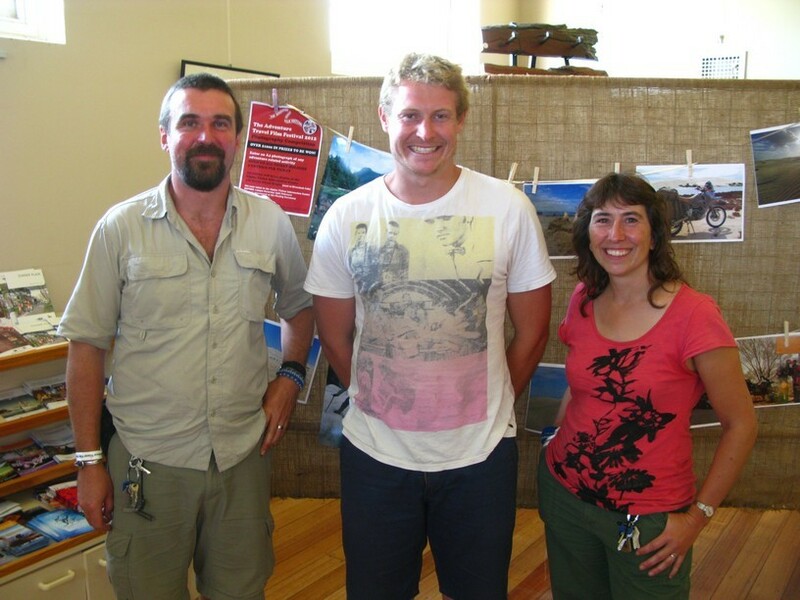 But on to happier things, the film festival was organised by Austin Vince and Louis Pryce to showcase adventure travel films around the world. It was running in the UK, USA and Australia this year and fortunately we heard about it in time to attend. 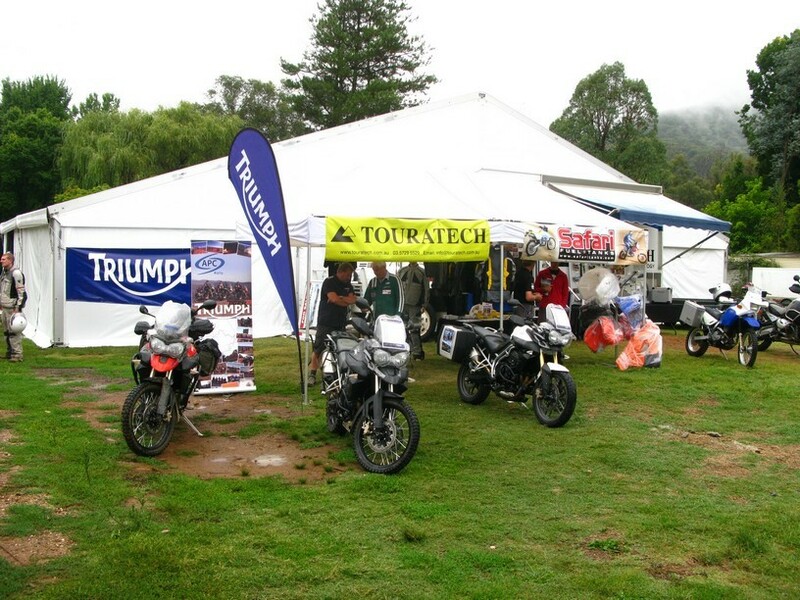 Although we offered we were too late to do a presentation but Rupert the Australian organiser kindly let us attend for free in return for putting the bike on display at the event (good on yer Rupert !). 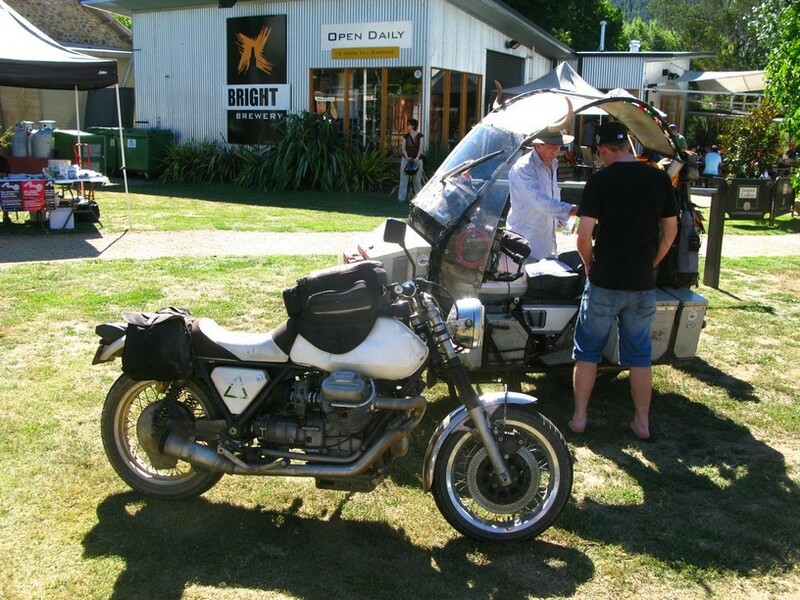 It was while we were parking it up on the grass out the front that we finally got to meet Martin the original “Mr Guzzioverland.” In the late 1980′s Martin ran a shop in London UK called Guzzioverland servicing and modifying Moto Guzzis. The business is no longer in existence and the name described perfectly what we are doing which is why I pilfered the name for our journey. 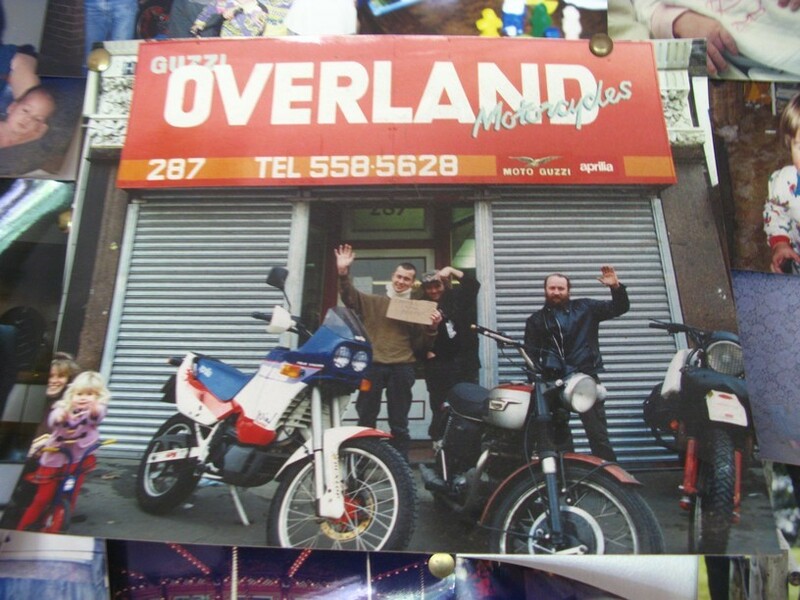 Here is a picture of the Guzzioverland shop in the 1980′s. 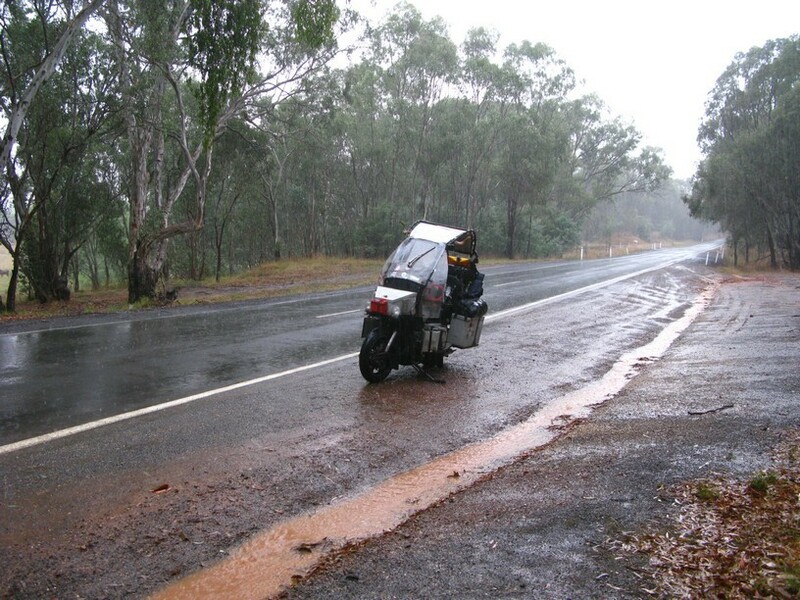 Martin is riding “Mr Completely” the Guzzi special that he built and rode out to Australia, in the 80′s, it has also been through Africa and many other countries and he estimates has travelled close to a million kilometres in its life. 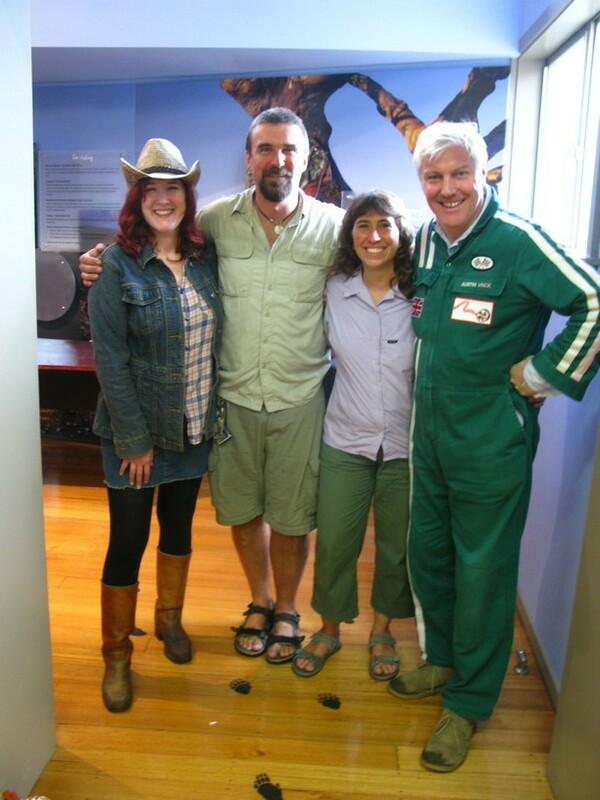 It’s great to meet him at last, we arrange to drop into his place below Melbourne on the way back from the festival. Martin and I are like chalk and cheese in our travelling styles (he has two tiny throw over panniers and that’s it !) but we get on and have a mutual respect for each other. Here is a picture of “Mr Completely”, the marquee at Bright and some of the other stands that were there. We have been filming as much as possible along our journey although it’s tricky when both of you are on one bike and there is no cameraman to capture what you are doing. We could have made a brilliant documentary given professional resources or dedicated our time to filming it but would the journey have been as good or as enjoyable? I doubt it ! Video cameras are delicate and expensive and we have broken camcorders and on bike cameras. Heat, cold ,humidity, water, dust and vibration are all enemies of electronics and we have experienced plenty of all of these. We splashed out on a replacement on bike camera in the January sales this year to ensure we had some footage. It tells the story of three overland travellers who purchased an abandoned boat in Turbo, Columbia, fixed it up and modified it so it was powered by their motorcycles and set sail from Columbia to Panama around the Darien gap. It was a great film and as Austin himself said it knocks spots of any commercial “travel adventure” programmes but it’s unlikely it will ever see the light of day on television. 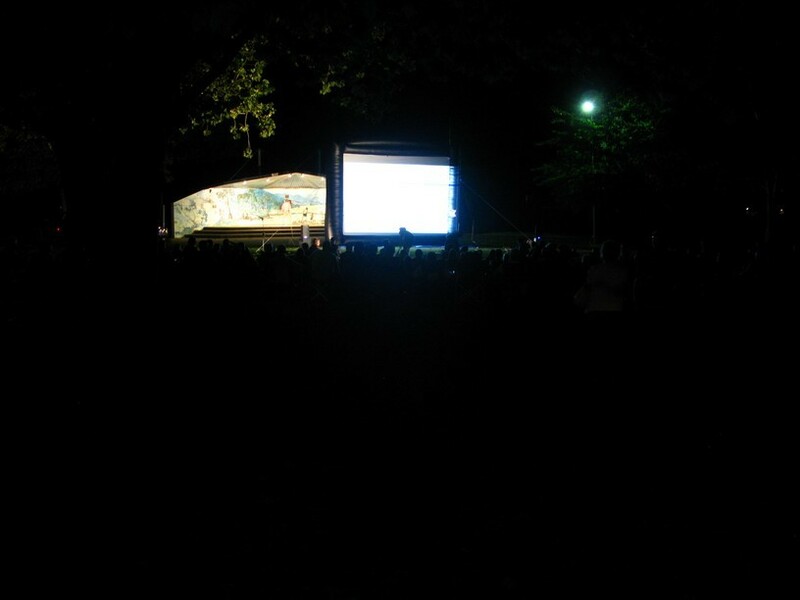 After dinner we wandered down to the open air screen in the park where the organisers were screening the 1956 film “First overland” about two Oxford and Cambridge teams who drove from London to Singapore in new land rovers. It wasn’t the first overland in my book, Robert Fulton Junior’s motorcycle journey pre-dates it as do others but it was a fascinating snapshot of that time and a superb piece of film making. So much has changed politically since their journey, they travelled through Burma and Afghanistan which would be impossible now, although things are definitely changing hopefully for the better in Burma (now Myanmar). 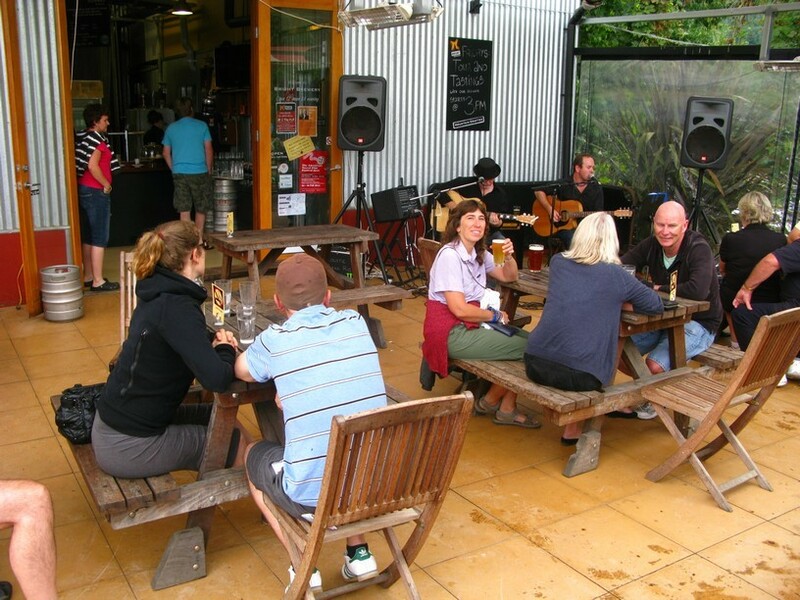 Here is a shot of the open air night screening and the excellent Bright brewery. 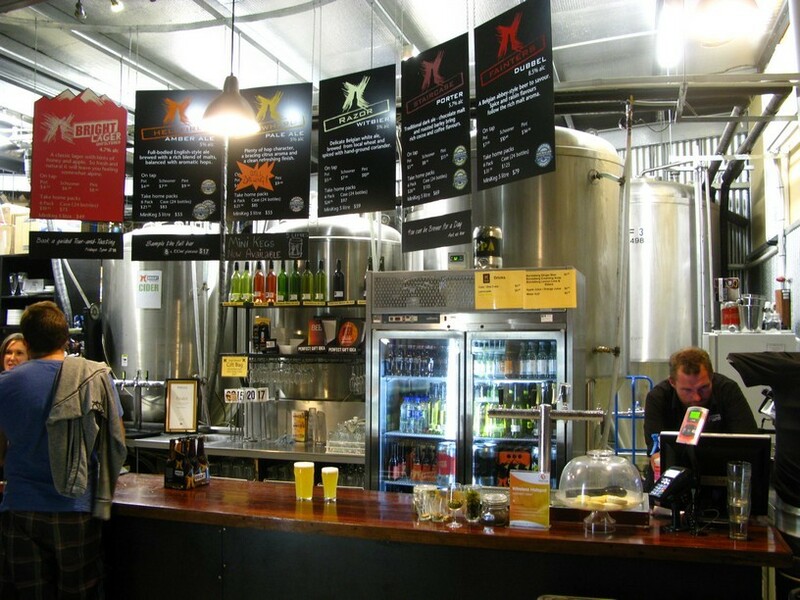 We could not afford to sample much but what we did try was very good. They laid on some music one afternoon as well. The next day was my birthday. Karen surprised me with a gift that Pete and Trish from Adelaide had given her to look after until my birthday. It’s a 1971 (the year I was born) 20 cent piece with a platypus on one side attached to a necklace. It’s a really thoughtful gift and I love it ! 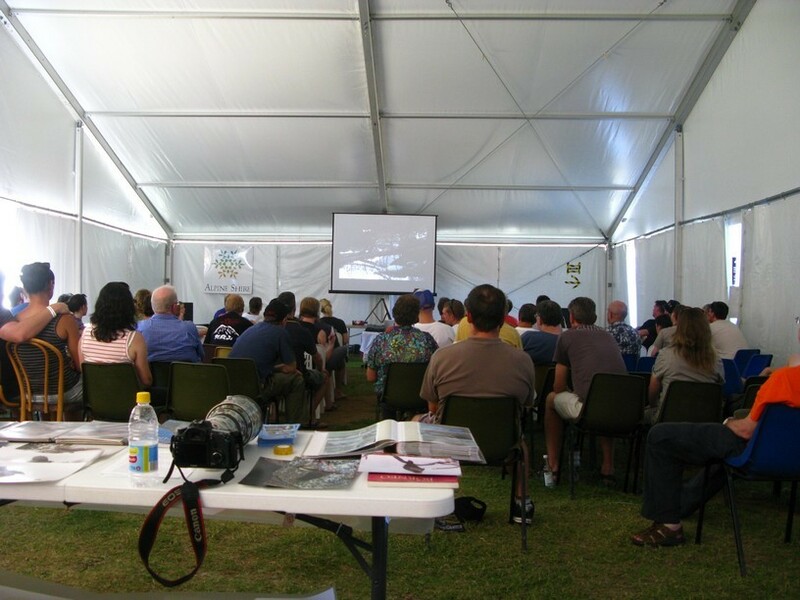 Later we attended an interesting talk by Tim Cope about his trips through Mongolia and Russia by bicycle and horse and we also watched a really funny film about the Mongol Rally amongst others. We had met with some of the last years competitors as we travelled through Mongolia. 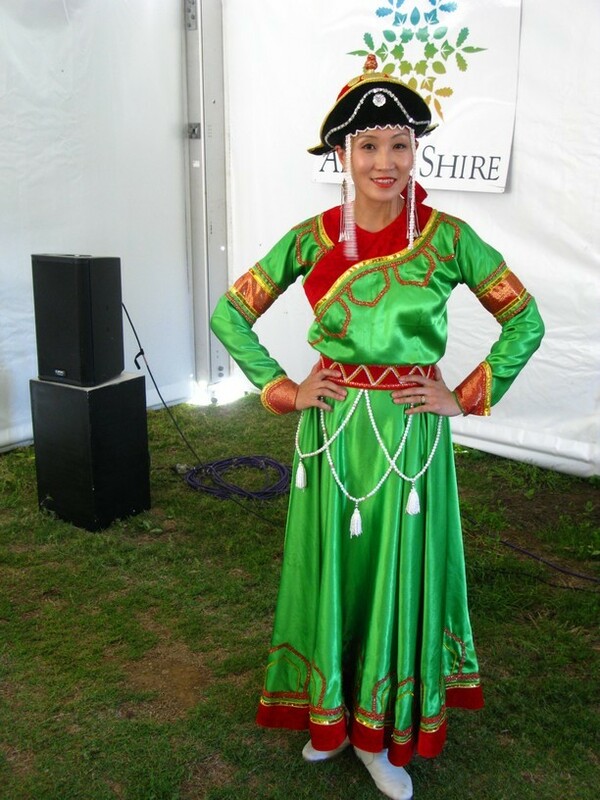 Here is a picture of Tim Cope’s surprise guest a Mongolian Traditional dancer who was very good. Friday and Saturday were both glorious days but Sunday bought rain, we missed our hats even more although we dodged most of the heavy down pours by watching the films and presentations. Monday morning it was heavier still and forecast to last all week so there was little point in staying to explore around Bright. We had a great weekend and it was well worth the detour. Here is a picture of us with Austin and Louis taken after the final film presentation. We followed Martins recommended route which was an absolute cracker despite torrential rain most of the way. 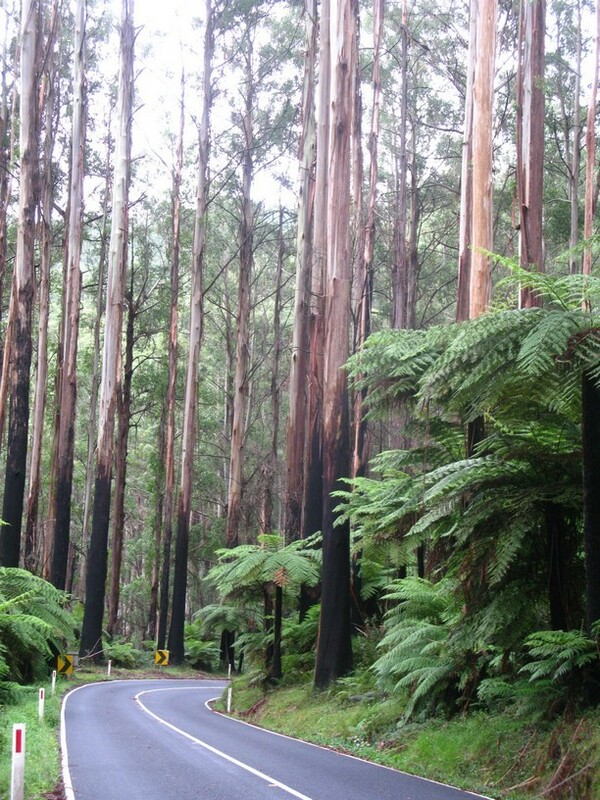 We took the mountain route through Whitfield and Mansfield around the lakes at Alexandra and through the super bendy thickly forested black spur route to Healesville where a guy on the side of the road was standing in the rain waving his arms around like a maniac. We figured we had better stop and it turns out his name is Bernd and he runs Stein Dinse the Australian arm of a big Guzzi parts distributor in Germany. He heard from Martin we were coming and wanted a look at the bike. Here is us hiding from the rain in a bus stop having lunch, the bike sat out in the rain and some pictures of the Black Spur and one of Bernd. 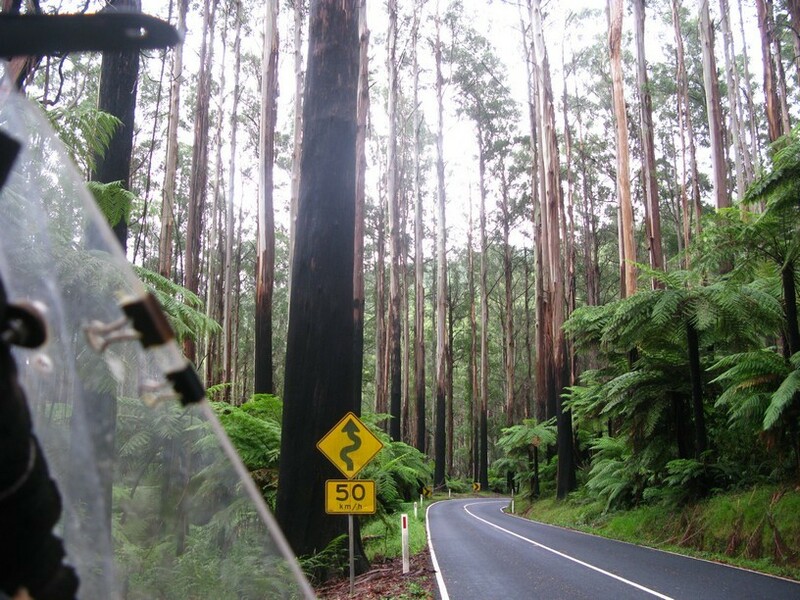 From here we headed through Yarra Junction, Gembrook and then Koo-wee-rup (I am not making this up) skirting down the side of Melbourne to the Mornington Peninsula where Martin lives. We got in about 7.30pm and were fed Guinness, lamb, potatoes and red wine in that order, yum ! Martin talks and thinks really fast and you almost need to video him and then play it back at normal speed to keep up. He is really switched on with setting bikes up and has already been thinking about some of the things we are going to have to do with carburation and timing for Altitude in South America. 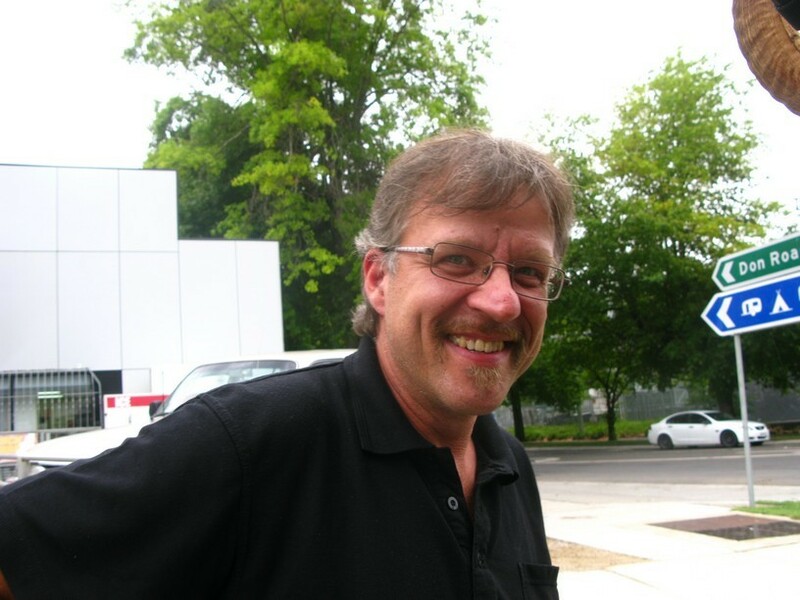 He helped me with some maintenance jobs next day and we bounce ideas around about carburation and try some things out. He suggested looking into an AFR meter which have recently come down to an affordable price and reduced in size. AFR stands for air fuel ratio and gives a readout from an lambda sensor placed in the exhaust, this tells you is whether the bike is running rich or lean or just right which would make jetting in South America with its ever changing altitude much easier and could save some engine damage. The theory is the higher you go the thinner the air is and the less fuel you need so you lean off the mixture as you go up, the dangerous part is when you come down as you need to richen up again or the bike will be running really lean which can burn holes in pistons. All this meter does is tell you what’s going on in the combustion chamber and unlike fuel injection if it goes wrong it isn’t going to stop the bike. It works with lots of different fuel types too as we are going to have to cope with ethanol enhanced petrol or should that be un-enhanced fuel in South America. It’s definitely on my wish list but I need to do some more research. Martin now makes his living making motorcycle clothing check out http://www.jacksonracing.com.au/ Most of his gear is made from Kangaroo leather which is really light and supple, he makes some clever ventilated leathers and takes the time to help people get clothing that really fits them. We had a great time at Martins and vowed to catch up again, before we knew what hit us it was time to head into Melbourne and meet up with the Moto Guzzi club of Victoria on their social night. This entry was posted on April 10, 2012, 10:42 am and is filed under On The Road. You can follow any responses to this entry through RSS 2.0. You can leave a response, or trackback from your own site.